We love Thanksgiving at Lara Metz Nutrition. We are dietitians who love food, coming together and making the most of time off with family and friends. It is truly a privilege to share in your wellness journey and cheer on all of your success. As a gesture of our gratitude, we’re sharing our favorite recipes for this Thanksgiving (or any meal to enjoy with family and friends) in hopes that you’ll enjoy them as much as we do. I absolutely love Thanksgiving! I love the lazy morning with my husband and children, snuggling in bed while we watch in awe the beautiful Macy’s Thanksgiving Day Parade. Then rain or shine, snow or sleet we go out for a family walk. As a self-proclaimed recipe addict, I spend hours upon hours researching and searching the web for new recipes and ideas for our Thanksgiving meal. I dream about my recipes, knowing guests find such pleasure during their Thanksgiving meal. This year I am especially thankful for my clients who trust me, and my brilliant team, and allow us into their homes and to be part of their health journey. 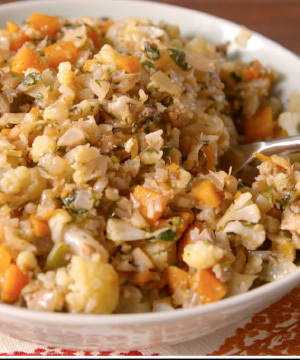 – Combine all seasoning in a small bowl and mix well. 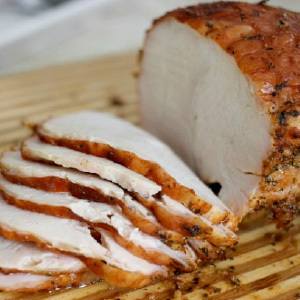 Coat Turkey with olive oil. Rub Spice mixture evenly all over turkey. Place Turkey in a baking pan with chicken stock. Remove from over, cover with foil, and rest for 30 minutes before slicing. Add onion, carrot, and celery and sauté until soft, 7 to 8 minutes. Add cauliflower and mushrooms and season with salt and pepper. Cook until tender, 5 to 10 minutes more. Thanksgiving to me is a time to recognize, honor and celebrate all of the blessings of our lives alongside family, friends and healthful foods. In my home, Thanksgiving begins on Monday, with the first of the cooking and preparation, anticipation and celebration. Monday is the day when I prep my grandmother’s pumpkin chiffon pie as well as the easiest make-ahead side dish that, in my opinion, is the jewel of the table and completes the turkey: cranberry apple relish. It’s as simple as throwing all the ingredients in a saucepan, bringing to a boil, and simmering for 15 minutes. Yet, in that short time, the smell of cinnamon, ginger, and freshly grated nutmeg (an impromptu addition to this year’s recipe as suggested by my daughter) begins to emanate throughout the house and the holiday season officially begins. When cooked from scratch, cranberry apple relish is an antioxidant powerhouse, full of cancer-fighting anthocyanins, vitamin C and heart-healthy fiber. 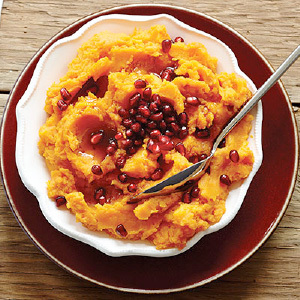 This Thanksgiving I’m adding mashed sweet potatoes with pomegranate seeds to my table. In my opinion, the potatoes are naturally sweet and delicious and don’t require any added sugar. Instead I’m adding spices, coconut oil and crunchy pomegranate seeds to round out the flavor and add different texture to the dish. May you have a joyful Thanksgiving alongside family, friends and an abundance of healthful foods. place on baking sheet and roast in oven for approximately 1 hour until soft, turning once half-way through the cooking time. Scrape flesh of sweet potato into a bowl. Add coconut oil, cinnamon, and a light grating of fresh nutmeg. 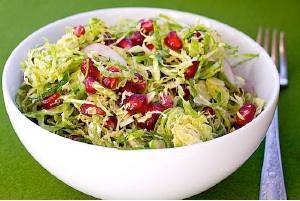 Top with pomegranate arils and shredded coconut. I love thanksgiving for its inclusiveness. No matter what your culture, religion or ethnicity, it’s a holiday that we all celebrate and enjoy together. At my Thanksgiving table, we always set a few extra places, because everyone knows that if they come across someone without a place to go for the holiday, they are welcome with us, and everyone will be genuinely thrilled to share the holiday meal together. Scrub the carrots well but do not peel. Trim off the leafy green tops of the carrots, leaving about an inch, and cut the carrots down the middle lengthwise. Toss the carrots with the olive oil, turmeric, paprika and salt. Place carrots on a rimmed baking sheet and roast on the middle rack for about 35 minutes, or until they are tender, stirring every 10 minutes. While carrots are cooking, whisk together the tahini, garlic, lemon juice, a pinch each of salt and pepper and 1-2 Tbsp of warm water. 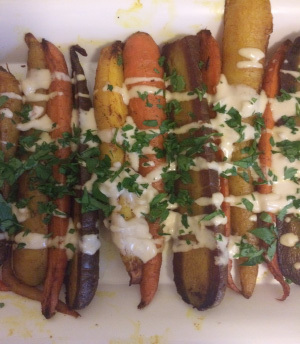 Transfer roasted carrots to a serving platter and drizzle with tahini sauce. There is nothing about food that I don’t love. I love eating. I love cooking. I can’t get enough of learning how different families celebrate holidays and rituals with food. It’s funny that I’m not usually that excited about the food at my own Thanksgiving Day feast. I guess that’s because I practice what I preach and the food really is secondary on this day of family, friends, our ritual football game, time together in the kitchen, and the great clean up pallooza. Don’t get me wrong, I love the meal, but I focus less on my plate and more on the humor of the bird that took two hours less to cook than planned, and the kid who lost a tooth in cranberry sauce. This Thanksgiving, I will. Trim the ends off the Brussels sprouts. Using the thinnest blade on a mandoline slicer and the safety cover, slice each sprout thinly. Slice the apple and red onion in the same manner. Toast the pine nuts in a skillet over medium-high heat, stirring frequently, until fragrant and lightly browned, about two minutes. Add to the Brussels sprout mixture. Combine the vinaigrette ingredients into a jar with a tight-fighting lid. Close the lid and shake until well-combined. Pour over the Brussels sprout mixture, and toss to coat. Refrigerate for at least 30 minutes. Sprinkle the pomegranate seeds on top before serving.